A huge crowd welcomed author and illustrator Mo Willems to the Decatur Library last night. He solemnly read from a selection of books. (Those of you who were lucky enough to be there know that I jest). He actually read We Are In A Book, one of the great books in the Elephant and Piggie series, with all of the animation of a Looney Tunes character. After answering a few questions, he read Knuffle Bunny Free, the latest and last of the beloved series, drawing laughs from everyone (and a few sentimental tears from the parents). Then he sent a huge Knuffle Bunny into the lobby to be hugged and mugged with the kids, and sat to sign a whole bunch of books. Among the signees were Pete the Cat's James Dean and Eric Litwin. Thanks to everyone who attended last night. You were a great crowd. 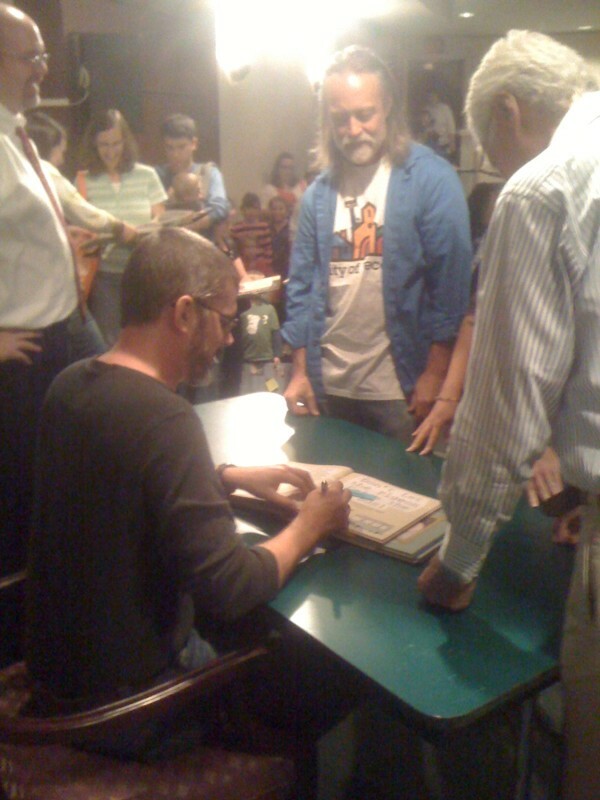 And thanks especially to Mo Willems for making it such a wonderful evening for all. PETE'S ALIVE! ALIVE, I SAID! Big Nate is Coming on Friday!